I thought the UK was starting to move towards a more sustainable urban future, but it seems the Royal Mail is out to prove me wrong. In what way, in these days of escalating fuel prices, congested road networks, and rising obesity - can it be a good idea to replace bicycles with vans and trolleys? And who makes these vans which will replace 24,000 British-built bicycles? Are they a UK company? Have they lobbied the Royal Mail in any way? Clearly there are many questions that remain unanswered. The move to new vans and trolleys (first brought up as a rouse for 'modernisation', now being pushed trough under the guise of 'health and safety') will cost the Royal Mail some £120 million. That in the heat of a recession the Mail has this kind of cash lying around to replace a perfectly functional, green, healthy system is beyond my comprehension... That it is totally at odds with the Government's Active Travel Strategy - which aims to get the general public taking up cycling - is self-evident. Again, considering the recession, it seems sad in the extreme that Pashley of Stratford-on-Avon will loose a huge order to continue producing bikes here in the UK. According to an article written by a cycling postie in The Guardian "The current stock of bikes are very sturdy, very low-maintenance. I've never known any of them to get a puncture. The entire fleet of bikes in our office are looked after by one man. All the parts are replaceable. If one part goes all he does is to whip it off and replace it with another: a five-minute job. Will vans and trolleys be so easy? I doubt it. The work will almost certainly need to be franchised out, adding yet more costs to the already beleaguered network." 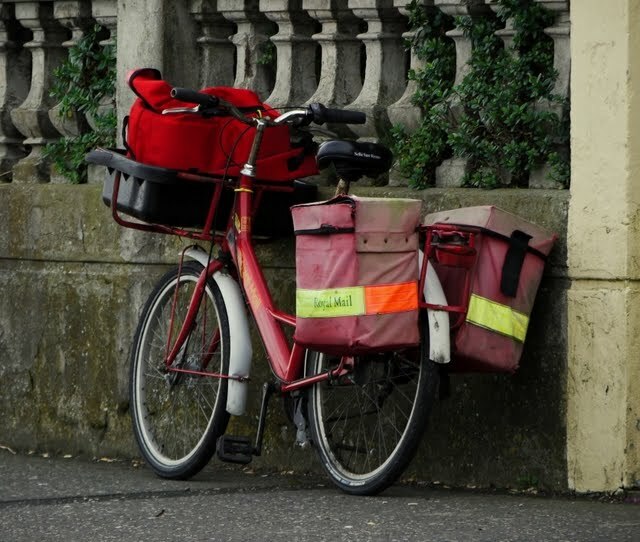 The national cycling organisation, the CTC, is leading the call to keep posties on their Pashleys. You can read all about their campaign here, and if you care about keeping more commercial cyclists on our roads (and more vans off them!) fill in their campaign form here, which hopefully is just the first step in a concerted campaign. Each form will automatically be turned into a letter, to be delivered by cargo bike to 10 Downing Street. Let's keep Britain - and its posties - cycling! That's really a shame. Where I live, here in Austria, delivery vans of all types of parcel services are the most obnoxious vehicles, that make lives of pedestrians, cyclists and even other motorists a lot harder, by basically ignoring any parking restrictions, pedestrian zones, or common courtesy most of the time. I had the pleasure of knowing Alfred, a retired postie who took care of the bike fleet in Croydon. It would've broken his heart to hear that the sublime Pashleys he repaired for so many years were going to be scrapped. I've submitted a letter - very easy to do! 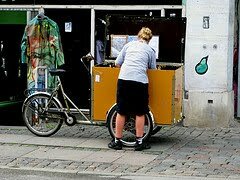 - and fervently hope that instead of losing the bikes, the opposite (cargos and trikes) will happen. Great stuff Dan, as you say the form is really easy to use so really there's no excuse for people not to do it. The Pashleys are great work horses and the idea that so many of them would go to waste is a crying shame indeed. I'll certainly get onto this... as a Pashley owner and lover, this does seem like a crying shame. 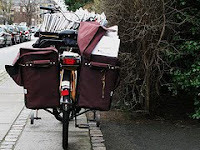 Of course the main thing is that this is such an eco-friendly manner for the PO to use too... my Uncle is a Postie, and years ago used to ride a Pashley to deliver mail! It appears from Adam Crozier's letter that there are two distinct but not totally unrelated reasons for abandoning bicycles. The first is a logistical one about the carrying capacity available to each postal worker, which seems plausible if the claims about the type of mail being sent are true. The second is the perceived danger for postal workers as a road user on a bike. It is this that is problematic, and no evidence is apparent in the letter for backing-up this assertion about 'a substantial proportion of accidents'. It may be based on the usual misperception about cycling, but we don't know unless there is a way of eliciting the evidence Royal Mail have to back up this assertion (e.g. further political questioning, Freedom of Information request or something like that). Of course, carrying heavier loads could pose some health and safety issues, and that would be a relevant consideration. But the concerns expressed in the Royal Mail about road safety letter seem to run contrary to experience, e.g. the 'safety in numbers' effect, which, incidentally, Royal Mail would make worse for everyone else of they took 24 thousand bicycles off the road. Which is a pity, as I wonder how much congestion motorised vehicles would subsequently suffer (irrespective of the power source) and hence delays, which they would not have had had they stuck to their bikes. Serve them right to pursue a seemingly retrograde policy! Insensitive comment: If they go bust, I'd love to have one, authentic panniers and all. Sensitive comment: I really hope they don't get rid of them. Your arguments are all spot on, and reflect the political hipocrasy. i would say, the decision to use the bicycle depends on the posties. let them decide. if they still prefer it, let them have it their way. Thanks everyone for your comments, I'll keep you up to date with any developments! This is a place for great inspiration, your blog is really interesting.